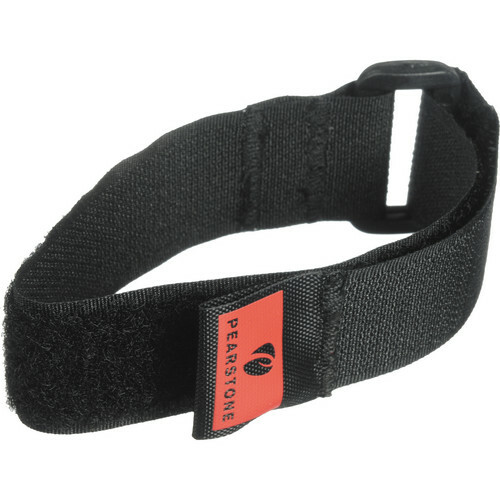 The black Pearstone 1 x 18" Touch Fastener Cinch Strap is a heavy-duty utility strap with extra strength and holding power. Its non-metallic construction makes it safe to use around electrical equipment. The strap is easy to use, and to fasten simply requires you to thread the pull tab through the buckle and pull the cinch strap tight. Then press the strap to itself to secure the touch fastener. Box Dimensions (LxWxH) 5.433 x 2.0 x 1.181"
1 x 18" Touch Fastener Cinch Strap (Black, 2-Pack) is rated 4.6 out of 5 by 12. Rated 5 out of 5 by CreativeImagesbyGary from Strap it and forget it! These straps work great for retaining smaller items. They will hold almost anything and they fit in my accessories bag with ease! Every photographer can use these! Rated 5 out of 5 by Nizam from Great little helper While some have used this to secure their cam to their long lens and some to just secure electrical cables, I have used my cinch strap to secure the extra large Lumiquest soft bounce. (I read that photographers were saying that the bounce definitely gives a soft light, but falls off easily using the Lumiquest supplied velcro). This works like a charm, even when I rotate by flash bracket horizontally. Rated 5 out of 5 by Matt from Security and peace of mind I bought these straps to secure my camera and 500mm lens to the tripod so when I move it or carry it to another position there is no chance of the camera falling off the tripod because I left the tightening screw too loose. It just gives me that added security and peace of mind, not to mention that it saves me a ton of money if I break my lens or camera!! Rated 5 out of 5 by Mike A. from Strap it Up! These little Buggers are Super Useful in a Pinch. They are reliably reusable and hold my junk in place. I need more things like this to hold my junk so people don't trip on it. Very highly recommended for multiple uses! Rated 1 out of 5 by David M. from Not Recommended This item works fine if what you're cinching requires an 18 long strap. Otherwise the small area of velcro at the end of the strap will not make contact with it's velcro mate and will not work as a cinch strap. Rated 5 out of 5 by Ian from assured security horizontal pull on velcro means it's not coming apart. Nice tough looking plastic buckle piece too.